We just found out about this today, but Selena, 16, went missing last Wednesday, May 14. She left her Kingsbridge-area home for Celia Cruz (on the Walton H.S. campus) in the morning with her viola and has not been seen since. Celia Cruz Principal William Rodriguez said Selena was a great student (with a stellar attendance record) who loved music. He said nobody at school could imagine her just running away without telling anyone. Celia Cruz held an assembly today in support of an effort to find Selena. They are distributing flyers like the one above to neighborhoods throughout the northwest Bronx. NYPD is not being very forthcoming with information on the case so far, but according to a detective at the 50th Precinct, detectives there are still working on the case and have not transferred it to the missing persons department. 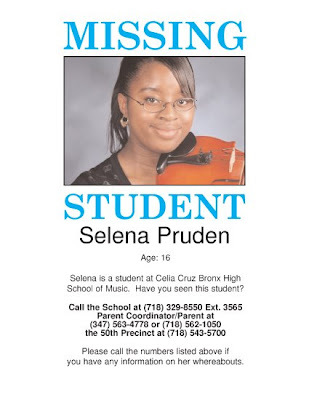 Again, if anyone has information about Selena's whereabouts, please call Celia Cruz, 718-329-8550 ext. 3565 or the 50th Precinct 718-543-5700. My Name Is Sophia. I'm A Friend Of Selena's.... I'm Asking For Anyone To Please Speak If You Know Anything About Her Where Abouts....Selena And Her Family Is In My Prayers. God Will Bring You Back To Us Safely!!! Never Take Anyone For Granted Because They Can Be Gone In A Blink Of An Eye...Only God Knows.